How did you learn about Maya Pedal and why, how, and when did you get involved as a volunteer? I learned about Maya Pedal from two sources. The first was a group of five Canadians biking from Winnipeg to Maya Pedal in 2006. I met them at Plan B, an awesome bike co-op in New Orleans. We rode together for a little while in Northern Mexico on my first long tour to Chiapas in Southern Mexico. In 2007, I biked to Pittsburgh from Washington D.C. along the C&O canal and Great Allegheny Passage for the BikeBike! Conference. Maya Pedal director and engineer Carlos Marroquín was there so I got to meet him in person and talk about his organization. 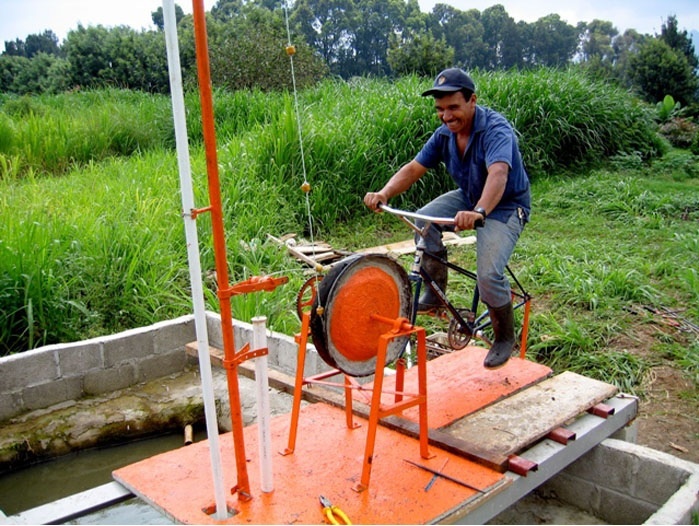 I thought it was so great to re-purpose old bikes into machines useful for working in rural Guatemala that efficiently perform tasks without electricity and provided a healthy lifestyle. Since then, I’ve always wanted to visit. Now that I am here (arrived by bicycle March 11, 2011), I am learning to weld and working on putting together a machine that removes black beans from their shells using pedal power. I am also working on improving the facility here. I recently had success establishing connections with the neighbors. Ultimately, it’s an arrangement that we can bring our kitchen scraps to a neighboring family to feed their chickens and cow. The remaining scraps go into a compost pile along with the cow and horse manure. In exchange, Rosa (the neighbor) will also let us set up a garden and use the compost. Then we will split the vegetable produce half and half. I and other Maya Pedal volunteers will start and help maintain the garden and continually bring more kitchen scraps for the chickens, cow, and compost pile. Our facility has no yard, and we had previously been slowly producing compost in a barrel on the roof with no end use, so this new arrangement is a breakthrough. Maya Pedal creates bicimaquinas or bicycle machines, but it is more than that. It provides housing and a kitchen for volunteers, who are in charge of running the facility. Volunteers are at the site 24-7 and we maintain the facility, respond to emails, update the website, cook for each other. We also help Carlos in the shop making the bicimaquinas, performing repairs and maintenance on customers’ bikes and cleaning and organizing the shop. So volunteers can help in the shop and the office and we can also help in improving the volunteer housing facility. 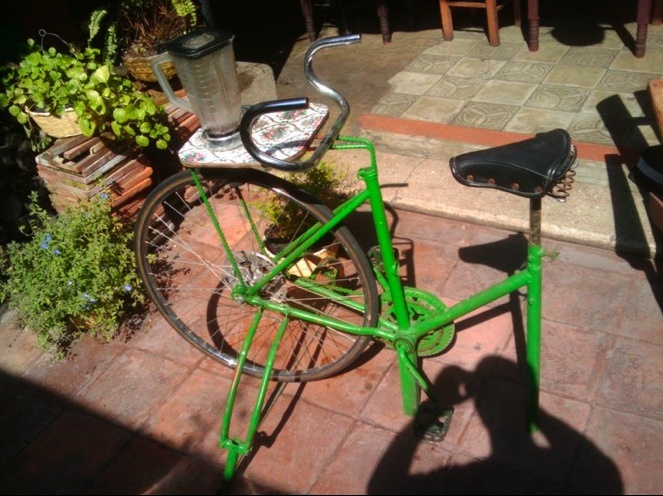 Bike powered blender. Photo from PJ’s blog. I understand that you rode from D.C. to San Andres Itzapa. That’s pretty wild. How did the tour go? Can you share some of your most memorable moments from the trip? I rode from DC to Chiapas, Mexico in 2006-2007. This time, I took trains, buses and biked to get to Cancun, then rode from there to San Andrés Itzapa from December 2010 to March 2011. I have a lot of stories from those two trips, many of which can be found by reading the archives of my blog. What stands out from those journeys has been the warmth and hospitality of people all along the route; the great healthy, tasty and cheap food in Mexico and Guatemala; and on this trip, giving rides to people of all types and ages on the back of my Surly Big Dummy. Maya Pedal might be my favorite of all the places I’ve been to on my whole trip. I love the town here as it is off the tourist path, the people are very warm and friendly, and food is cheap, abundant and tasty. And as a multi-faceted facility, Maya Pedal provides for interaction with interesting, dynamic, like-minded folks visiting and volunteering from all over the Americas, Europe, Australia & New Zealand (of course, volunteers are welcome from anywhere, but those are the sources of our volunteers historically). It is a great place to experience a typical Guatemalan town, contribute to a great organization, and have a retreat where you can hang out with peers. If readers wanted to help out Maya Pedal, what’s the best thing they can do to lend their support? One of the most important things a volunteer can do either on site or from the United States is to help organize and fund shipments of used bikes to Maya Pedal. We are in dire need of another shipment now as we have not had a shipment in 12 months. Normally, we receive a shipment every 6 months. Funding is needed to pay for the shipping costs, so financial contributions are most useful. Donations can be made to Maya Pedal or to an organization that is arranging a shipment, as Maya Pedal splits these costs with the sending organization. Historically, we have primarily received shipments from Bikes Not Bombs in Boston and Working Bikes in Chicago, but other organizations throughout the country have shown recent interest in making a shipment. A shipment must be at least 400 bikes to make it economical and we are especially in need of mountain or hybrid bikes as opposed to road bikes. And we need small and medium-sized bikes as opposed to large and extra large bikes. Tips on arranging a shipment in the most economical way can be obtained by contacting either of the organizations mentioned above. Having a fundraiser for making a shipment might be the most effective thing you can do to help Maya Pedal crank out more bicimaquinas. What’s next for you? 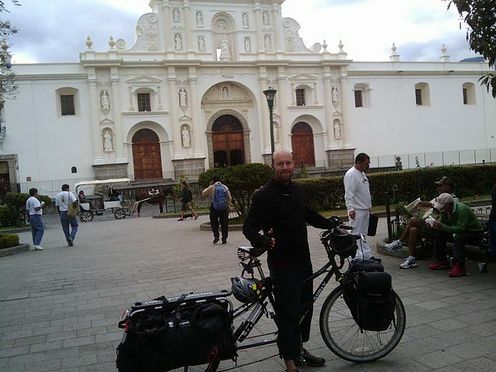 Are you going to continue your bike tour in Central and South America? Yes, I am going to continue South on my Big Dummy through Central America and into South America, perhaps ending in Brazil and perhaps doing some more touring throughout South America. This entry was posted in Advocacy, Bike Touring, Interviews, Mechanics and tagged bicimaquinas, bike touring, bike touring in central america, guatemala, maya pedal, pj park, san andres itzapa. Bookmark the permalink. Great article and information . Makes me want to get to this place . Sounds like the way to go and great use of old bikes and answers so many of our environmental problems . Natural and so creative. The country looks beautiful – I am there. Hey PJ, congrats on the article and your involvement with Maya Pedal. I lived throughout Central and South America for many years and can appreciate your journey. I especially loved living in Cancun (about 6 years). I now live in the Washington DC area and coincidentally and occasionally volunteer for Bikes For the World. It’s one of the biggest non-profit organizations in bike donations overseas. They shipped over 9,000 bikes just in 2010 and will be reaching the 60,000 mark since they opened a few years ago. I suggest you contact them and let them know of Maya Pedal if they don’t know already. Keith is the Exec. Director there, warm and friendly bike enthusiast. Good luck and I wish you all the best. Un fuerte abrazo, David G.
PJ – What a challenging trip! I am so happy that you are still looking forward to reaching your goal. I would send my bike to Maya Pedal, but I gave it to someone out in the country here who needs it more than I do. I hope that you continue to enjoy your adventure! Peace and all good! S. Mary Z P.S. I hope that you remember me from Little Falls. What a great story! May I have permission to share it and the photos in our Associate newsletter? Please let me know. Thanks and safe travel as your adventure continues! There seems to be some confusion as to where they’re directed to. While the comments are public, this is my blog, for which I interviewed PJ, so I can’t say for certain whether or not he’s seeing your comments. If you leave a comment on PJ’s blog (http://biketobrazil.blogspot.com/) he will definitely see them. Judy, email me (info@thebicyclestory.com) and we can talk about permission to reprint the interview.